Call us at 780.463.2802 to schedule a free, no obligation, quote today! Located in Edmonton Alberta, Garage Frontiers is the supplier and installer for all your garage needs and upgrades. Cabinet systems, flooring, and storage solutions are available. Please contact us today to design the garage of your dreams or learn more about our variety of options. Flexible financing and payment plans available. Garage Frontiers is proud to be a member of the Baeumler Approved organization. All members are required to prove and make a continued commitment to honesty, integrity, and quality service. Members must sign and adhere to a strict code of conduct which ensures compliance with insurance and WCB coverage as well as top notch safety certifications and practices. Customers choosing a Baeumler Approved contractor can rest assured that they have engaged a professional organization committed to delivering the best results! ”Professional all the way! Jeff and Jim were great to deal with from the original quote until completion. They offered some great suggestions and the job was completed by their crew on time and as promised. My neighbors were dropping in and commenting on the beautiful garage that they designed. ”My experience with Garage Frontiers could not have been better or run smoother. My floor was prepped before the Racedeck was installed. The tiles were installed in the pattern exactly as I had planned using the Racedeck planner. I am very pleased with the my new garage cabinets. I now have lots of storage space, and my wife is pleased with how tidy it is now in the garage. ”I met Garage Frontiers at the Edmonton Home and Garden show at their booth, I explained what my need was, they give me a date that they would come and give me a quote. When the quote was agreed they give me a date as to when they will be on site. When on site their employees are very knowledgeable about the product and procedures of application. ”While I was searching for a product and company to supply and install a product on my garage floor, I was referred to Garage Frontiers. They were very knowledgeable and experienced with supplying and installing a product that would not only protect my floor, but make my garage look like a garage to be desired! I was so impressed with the Staff's professionalism and workmanship. They met with me and helped me choose a colour and product that would be installed in 2 days. Before I knew it, my garage was looking like a million dollars! ”In September of 2017 we had the opportunity to meet the gang at Garage Frontiers while attending a Saturday function. What we saw in their showroom and learned by talking with them and the others in attendance was that these folks understood the business they were in. Our next step was to meet with Jeff Stern and have him look at our project, discuss our options and obtain a quote for work. Jeff showed up on time, discussed with us not only what we wanted but made suggestions about what would work and engaged both my wife and I in a very professional manner. Upon receipt of their quote it appeared to be in line with budgets we had in our mind and we proceeded. The work was executed well and shortly after beginning the work was complete. The onsite folks were professional and neat in every way. Following the work being done we had some questions and concerns. Jeff met with us and we worked through the concerns making a couple of changes to the work done. These were all tended to in a prompt and professional manner. ”When shopping around to get my garage refinished, I spoke with numerous companies. Jeff from "Garage Frontiers" was the most informative, that and his promise of a no hassle 10 year warranty swayed me to them. My floor was in tough shape with a fair amount of salt damage, it's only been a few days but looks great. ”Jeff and the team with Garage Frontiers, provided excellent service for me when installing the floor coatings in my rather large Man Cave. Jeff and Jim were able to rearrange there workforce to accommodate my challenging timeline. The required comfort level with Garage Frontiers was high, as I needed to leave the country for several weeks for work, while my floor was to be worked on. I was lent the use of one of the companies enclosed trailers in order to easily load and secure the cave contents at my convenience! The entire process went smoothly, as Jeff kept me updated with pictures along the way. In truth, I believe Jeff was as excited with the results as I was. ”Jim and the team were exceptional is all regards. Friendly service all the way. I'm exceedingly happy with my garage and the work that they did. Would recommend this team for any job, big or small. They were professional, and did a high quality job from start to finish: floor repair and coating, cabinet installation, carpentry, and storewalls. They were patient with my uncertainty in what I wanted, and my few changes along the way. They made me feel like anything I wanted to do or change was possible, and were more than happy to get everything done just as I wanted. ”The team at Garage Frontiers were amazing to deal with right from the first time I contacted them. They answered all my questions and provided great suggestions for how I could get the garage I wanted within my budget. Garage Frontiers was able to add a splash of the colour I wanted to one of their regular colour choices creating a perfect floor finish. And once it was applied I was super impressed with how incredibly strong the finish is and how perfect the colour is for me! I also purchased a Lift King car lift and have been super impressed with the lift and with the great crew that installed it and showed me the (very simple) operating instructions. ”Being in a client service business myself for over 30 years I’m very aware and critical of what is required to provide expectational client service. From my first contact right through the completion of the job everyone’s at Garage Frontiers was professional and obviously cared about the interaction. After coming out to assess the job I received a timely detailed quote which was adhered to. The owner Jeff Stern who I believe to be very knowledgeable about not only the product but how to lead and train his staff stayed involved from start to finish. He even jumped in spent some time on the tools to support the staff and make sure everything was going smoothly. I was provide with a complete schedule of when the estimate would be ready and when the job would be done which Jeff and crew adhered to. Every question was appropriately answered whether it was product or process related. In short I can’t say anything but good things about the experience. Garage Frontiers is an authorized installer/applicator for many of the top industrial coatings manufacturers. Our technicians are factory trained with the backing of the best representatives in the industry. 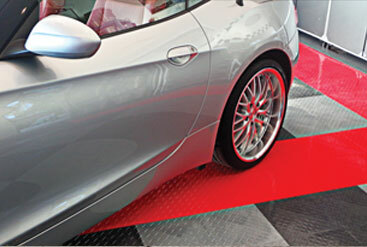 We are an installer of RaceDeck floor tile systems. 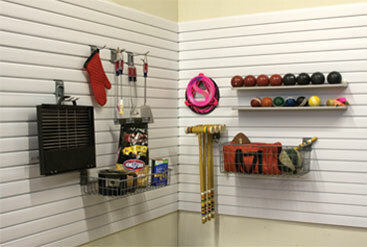 Our team will install your storage solutions from cabinets, to overhead racking, slatwall systems and more. We take great pride in our work and will ensure you are delighted with your new garage. 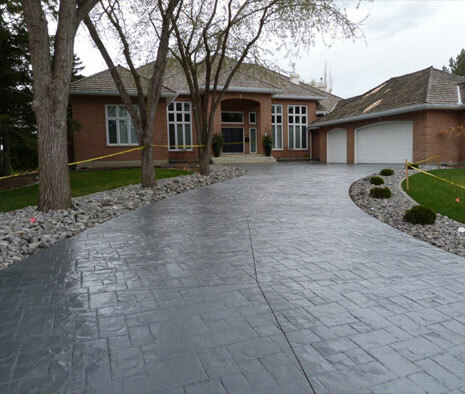 Through our parent company, we have been operating in the Edmonton area for almost 15 years finding solutions to concrete issues. 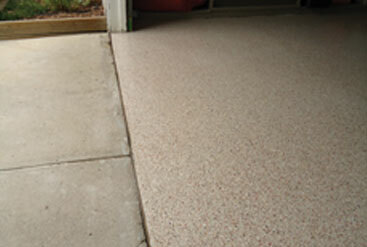 Providing and installing decorative and functional concrete coatings is our technical specialty. Garage Frontiers floor coating systems are for professional use only and are installed by factory authorized coating contractors. Our tech support group is led by a NACE certified coatings inspector with nearly 2 decades of experience in applying epoxy, urethane and polyaspartic coating technology. Our teams engage regularly with our suppliers ensuring they are up to date with all current coating technologies and application methods. We pride ourselves in not only providing solutions to concrete problems and storage issues, but also in our technical prowess. Garage Frontiers has the experience and skill to recognize and diagnose failures in concrete slabs, coatings and in the many phenomena that can present themselves in concrete structures in our region. In addition to our technical skills, Garage Frontiers will help you with design ideas, color and layout choices to make the most of your investment. 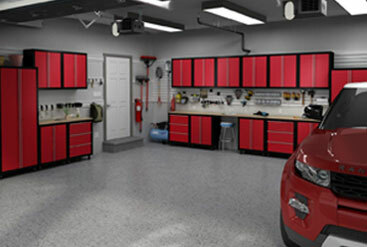 We want you to be thrilled and proud of your garage interior.